SLD Pumps and Power, part of Carrier UK and of the European arm of US corporation UTC’s Building and Industrial Systems Division, played a vital part in delivering the ‘largest exercise of democracy’ in recent British history – the Scottish Independence Referendum. 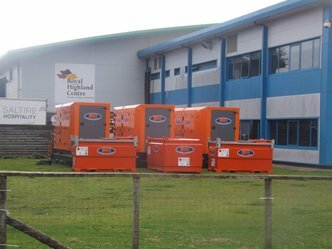 The largest part of the count for ‘Yes’ or ‘No’ in the Scottish Referendum was held at the Ingliston Royal Highland Centre complex in Edinburgh where the power was provided by hired generators supplied by SLD. Reliability is key on such occasions and, although it went without a hitch, an on-site engineer came as part of the package. SLD is used to high profile occasions and has experience of short time hire at huge events all over the UK in recent years. The generators were in place for several days beforehand and underwent the same tests as the whole counting operation which couldn’t have taken place without the power for the electrical equipment, the cooling and heating arrangements and the lighting throughout the decisive night’s work.